Lotto, Beau. (2017). Deviate. New York: Hachette. I like books that extend my thinking and invite me to reflect. My dissertation was on reflective thinking which undergirds much of the coaching I do with educational leaders. When I saw the introduction titled ‘The Lab of Misfits’ I knew I would get something from this book. An unknown gift later in the book used Gottman’s research on marriages as another template that I will explain later in the summary. As before, italicized words are directly from the book. We know that perception matters. Whether or not we believe perceptions are true or our intent is honorable, perception drives responses and behaviors. It influences how we see the world of others and how others see us. Lotto created a company he calls, the Lab of Misfits where everyone can be themselves, provide a playful environment, and promote creativity. An early quote, “Uncertainty is the problem that our brains evolved to solve” caught my attention. Most of our issues are fueled by uncertainty, not knowing, and trying to figure out how to increase predictability in business and life. I do keep in mind the title of Marshall Goldsmith’s book, What Got You Here Won’t Get You There. To me, this means we will be constantly faced with the FUDs of life. Fears, Uncertainty, and Doubts. The question is not how to make systems change proof, the question is, ‘how do we respond to a changing world?’ Lots of things we cannot control. “Nothing interesting ever happens without active doubt.” This is another quote that interested me and scares me. To deal effectively with doubt takes courage. Of course, by actively confronting doubt and asking questions about the issue can pay big dividends, although the actions to get through the issue may be emotionally hard. Those problems we are able to overcome strengthen our knowledge AND give us additional problem-solving processes for future use. Your brain will reward you through the new processes opens. The humility of asking for help to solve problems also establishes stronger relationships. I always try to remember from my work in reflective thinking, questions can generate new thinking. Judgment tends to shut down thinking. Peter Block taught me, what he calls a bonus question to ask, “what question if you had the answer to, would set you free?” I have used this stem in many situations e.g. ‘what question, if you had the answer to, would make you a better leader?’ ‘would make a more effective team?’ Put your own ending on this stem. Information We Take In Is In Constant Flux. All Stimuli Are Highly Ambiguous – Everything that passes through the windows of our perception is open to infinite interpretations because the sources of the information are multiplicative—meaning the information arising from multiple sources in the world is effectively multiplied together, creating information that is ambiguous. There Is No Instruction Manual – your brain must create the meaning which engenders a response—not the response, but a response. The author suggests that learning is a long-term relationship with trial and error. Several management gurus talk about double loop learning and systems thinking. So, the broader you can see, from diverse points of view, the application from one genre to another can be productive. A colleague, of mine, Bob Garmston, once told me, “the person with the most flexibility has the most influence.” I believe that is true in generating possibilities. However, we still must take action (trial), see what happens (success or error), and make necessary adjustments. Context matters. There are several examples of someone with a disability in one setting is extremely valuable in another. Two examples come to mind. 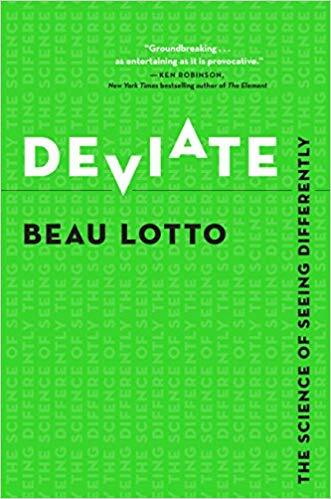 The example in Deviate is having blind women that are being trained as medical examiners for breast cancer. They find more lumps than gynecologists who have good eyesight. Another example comes from the Israeli Air Force. Sustaining focus on radar screens is very difficult for service men and women. They found people with autism have the ability to focus for longer periods of time without getting distracted than people without autism. What we know from brain research is that the brain is constantly integrating information from all the senses and blending that information. Think about it. Has anyone ever asked you to solve a problem based on what you learned in tenth-grade world history class? Has anyone ever asked you to solve problems using only your left hemisphere of the brain? As a matter of fact, the more experiences you have, the more possibilities in solving problems become apparent. The brain processes information holistically. In addition, keep in mind that action, or trial, provides real-time testing or explicit results to ponder. Data is just data, we make meaning of the data and decide what is helpful, what are independent variables, and what might need to change. Seeing is believing gets it wrong. Try the following two exercises which are provided in the book. Exercise #1: The task here is simply to read what you see (aloud or in your head). I’m guessing that you read: Can you read this? What are you reading? Remember the instructions: read what you see. Instead, you read words that don’t actually exist in the letter-string presented. Why? Because experience has resulted in a brain that has encoded within it the statistics of co-occurring letters in the English language. Exercise #2: What do you read? 46% of people read “is seeing believing. 30% of people read “seeing is believing, 24% of people read “believing is seeing. The brain does help us out in many ways. The brain likes closure and answers. The brain helps fill in blanks. If you want creativity, give a problem and don’t give the answer. People will create or make up many possibilities. IF, however, ACCURACY IS IMPORTANT make sure you fill in missing information before people leave the meeting. (Caps are Bill’s) The brain is a pattern-making device. If you want conformance, make sure all issues are finalized. If you want creativity, leave issues open for discussion. Stories are important for the culture. What stories live on in the organization? Most are good, some might be bad, and some, unfortunately, might be ugly. However, stories do set organizational norms. The key is that stories can change us in profound ways. They can set expectations. One of my former bosses said, “what we permit, we promote.” I have never forgotten this. The good news, psychologist Dr. Richard Wiseman has pioneered the systematic study of chance and luck and has found that people who are consistently “lucky” in life share patterns of believing things will work out well in the end; being open to experience; not ruminating on disappointing outcomes; taking a relaxed approach to life; and looking at mistakes as learning opportunities. Beware of confirmation bias. We tend to look for things that confirm our prior beliefs. As a person who serves on doctorate committees, it always amazes me how candidates will discount contrary data to support their initial theory. Sometimes the outliers are the most important. In short, your assumptions make you, you. Yet the process of creating these brain-based biases that give you your you-ness” also endows us with the unique people the world so badly needs (whom I’ll refer to as “deviators”). Change is built into our systems. We must remain adaptive to changing environments. Creating space for authentic dialogue to discuss ideas and feedback is helpful to deviate ahead of the curve rather than reacting to events. (Ah, the iceberg rises up again). Seeing differently—to deviate—begins with awareness … with seeing yourself see (but by no means ends there). It begins with knowing that some of those, often invisible, assumptions that maintained your survival in the past may no longer be useful. You are aware that you are usually unaware. But data is not understanding. Gathering data is easy, to re-emphasize the point cash isn’t in knowing, it’s in understanding. Being able to question our assumptions is what provokes new thinking and sometimes, new ways of thinking. Honor the deviates when considering options, they may be on to something. To Question begins a “quest,” and a journey into the unknown. The most insightful quest begins with “Why?” … especially when targeted at what you assume to be true already. Engaging with people in the world as if they were an unchanging, measurable “average” can have disastrous effects. We all know the old adage: the devil known is better than the devil unknown. Hmmm, maybe. How about celebrating doubt and creating the internal systems that can deal with doubt. Having options, like scenario planning and other strategies, can create options on how to respond by dealing with doubt up front. One of the most powerful pieces of research is by John Gottman. His book Why Marriages Succeed and Why Marriages Fail has been quoted and referenced for many years. Gottman has been able to predict the result of the marriages over ninety percent of the time by watching the conversational patterns. Because of this book, I made the connection from the Gottman’s research on marriage to organizational patterns. Gottman identified what he calls “The Four Horsemen,” a quartet of behaviors that almost invariably lead to the downfall of a couple: criticism (as opposed to simply voicing a complaint), contempt, defensiveness, and stonewalling. Think about where you are with colleagues, workgroups, and the organization. OK, you can also make connections to your own relationships too. Gottman goes on to say that it isn’t necessarily that there is disagreement, it is how the disagreement is resolved or left unresolved. Our frontal cortex in our brain is where the executive function is located. This is where control happens, and it has the responsibility to decide whether to go or to stop. It has the power to override the amygdala’s emotional responses. Although remember, the amygdala will always respond quicker than the frontal cortex decision-making process. The next stage is Contempt. Unchecked, criticism can become contempt. When our colleagues act with contempt, it is more than disagreement, it becomes personal. When the relationships move to more than ideas into the personal range, the cohesiveness decreases at an accelerating rate. Left unchecked or addressed, the individual or group moves into defensiveness. Defensiveness causes people to put on their armor, to protect themselves, and resist any positive comments to others’ ideas. It really ends up in blame avoidance and withholding their best self and their best ideas. Ultimately, left to continue to spiral down is separation. In the separation phase, people stay in their office or cubical, only coming out for mandatory meetings. Talk usually is confined to their own faction. People decide who is with them and who is against them. Their relationships and ideas stay within their own group and teamwork and creative problem solving really suffers. The worst thing is they stay on the team and withhold any contributions. They may be cordial but that is where any connections stop. If anyone wants my notes from Gottman’s Why Marriages Succeed and Why they fail, feel free to contact me and I will send them to you. Sommersb4@gmail.com. Put Gottman in the subject line. Gottman outlines possible actions to take in each phase to help improve the relationship. Better yet, buy his book and have the actions and surveys at your figure tips. Finally, Lotto pulls research from Robert Full. Full writes about the job of leaders. Ask Why? Assumptions many times are out of sight but operational in behavior. Observe – share what you are seeing and hearing. Then, repeat the process. Celebrating uncertainty: to approach “stopping” and all the questions this stopping spawns from the perspective of gain, not a loss. Openness to possibility: to encourage the diversity of experience that is the engine of change, from social changes to evolution itself. Cooperation: to find value and compassion in the diversity of a group or system, which expands its space of possibility—ideally, combining naivete with expertise. Intrinsic motivation: to let the process of creativity be its own reward, which will enable persistence in the face of tremendous adversity. Intentional action: ultimately, to act with awareness to engage consciously, from the perspective of Why. Lotto returns to his original thoughts about PLAY. To deviate is to take another path. Play with ideas, processes, and learning from trial and error. He asks a question: Why can’t we make this better? Great question. With trust and good group interaction, we can make things better. Mine the minds of you and your colleagues for better results. Failure isn’t always not getting the outcome you planned for. Failure really is not learning anything from the project. If no learning occurs, we keep doing the same thing expecting different results. Einstein once said that is insanity. I agree. Lotto’s last statement in the book is: Welcome to the Lab of Misfits. Can we create this lab to excel to greater productivity, efficiency, and having people show up as their best self to contribute to each other and the organization? Block, P. (2002). The answer to how is yes. San Francisco: Berrett-Koehler. Lynch, D. & Kordis, P. (1988). Strategy of the dolphin. New York: FawcettColumbine Book. Pascale, R. (1990). Managing on the edge. New York: Simon and Schuster.